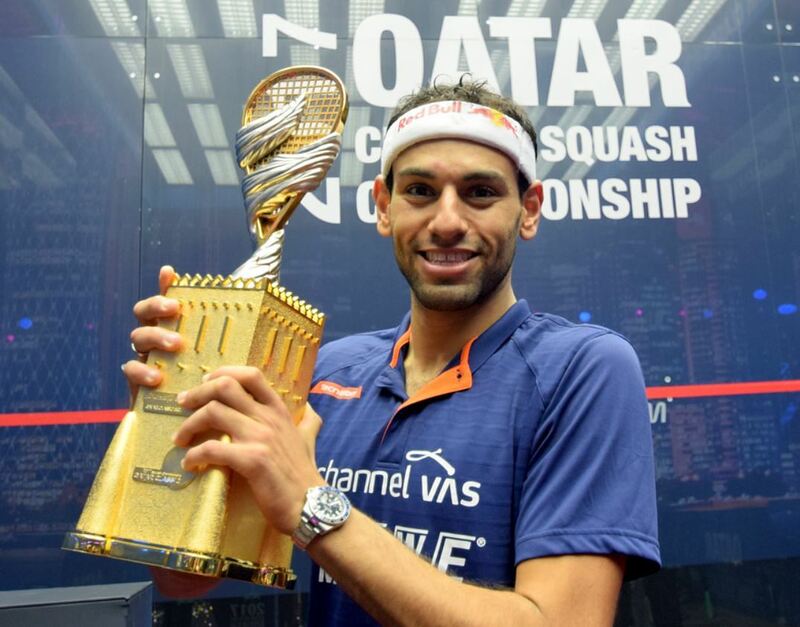 Egypt’s Mohamed ElShorbagy won the Qatar Classic title for the third time in his career courtesy of a 3-1 win over compatriot and surprise 2017 finalist Tarek Momen in Doha’s Khalifa International Tennis and Squash Complex today. Competing in his sixth straight Qatar final the 26-year-old from Alexandria showed his championship calibre throughout the event as he swept past World No.8 Fares Dessouky, World No.4 Ali Farag and World No.1 Gregory Gaultier to reach the title-decider – where his big game experience was too much for debutant finalist Momen, the World No.7. ElShorbagy who took the opening game as Momen, competing on the biggest stage of his career, showed signs of nerves and while the 29-year-old rallied to take the second game he was ultimately a step behind ElShorbagy from then on as the former World No.1 prevailed 11-8, 10-12, 11-7, 11-7 to add the 2017 title to his wins in 2013 and 2015. “When I saw the draw pre-event I knew it would be tough. I had to play the World No.9, the No.5, the No.1 and the No.7 to win, but playing tough opponents is the challenge that I live for. To be the best you have to beat these players. “This week I got it right and I felt I played the big points well,” said ElShorbagy. “What made the difference today was my experience. I have been in so many finals. But it was his first. I knew the emotions he was going through. “I was trying to contain him but at times he was like a train – I just couldn’t stop him. When he took the second game it was a big blow for me. He really pushed me and I feel this is jus the beginning for him. If he can keep that momentum, he’ll be hard to stop.